Imagine you spent your day slaying trolls and goblins. You saved your fair share of princesses (or princes) from tall towers guarded by evil wizards (or witches). After a long day of questing, you just want to go where everybody knows your name. Barring a trip to Boston, a tavern, known world-wide for their brews, will have to do. This particular tavern’s brew is The Dragon. The Dragon is so highly coveted that the tavern’s customers are willing to fight tooth and nail for a single sip, let alone the last flagon left in the joint. That is exactly where we find ourselves at the start of a game of The Dragon & Flagon. The newest board game from designer family Geoff, Sydney and Brian Engelstein offers a thematic shift from deep space (Space Cadets) to sword and sorcery. Players control their characters’ brawling adventurers by programming their moves at the tavern. You have a limited time before the local guards arrive to break up this brawl and your reputation is on the line. In fact, those are the two currencies of this game: time and reputation. The player with the most reputation wins, and every action taken to get to that goal costs precious time. When the game starts, each player has to plan their first two turns. In random order, they resolve their first action, which will place each player at different places in the time track. Whenever their next turn comes up, they have to add another action, and resolve the action they had previously planned. Sometimes they go off as planned, sometimes not, and sometimes with unexpected results. Based on the actions taken, the players will hopefully gain reputation. The only way to do so is to take it from another player. Each player starts with 20 reputation tokens and this amount will go up and down as the game progresses. Players can modify this with various actions, such as jumping on top of a table and boasting. As the game goes along, a player may make it to the center of the tavern, where the precious Dragon Flagon is located. Once picked up, the player holding the Flagon gains access to their Dragon card, a special action card. This is a one-time use card you hold onto until used and can be reacquired if you lose and reclaim the Flagon. These cards’ abilities vary, such as Teo the Monk’s flying Dragon Kick, or Thras the Barbarian’s Battle Frenzy, which screams reputation out of her opponents. The Dragon & Flagon is at its finest when you can accept that your best laid plan will not come to fruition. If you’re the type of player who wants to make a plan and is worried about deviating from it, this isn’t the game for you. I should also caution that there are some character-specific cards that could lead to balancing issues. Montero the Swashbuckler has a number of moves which require that he’s in close proximity to his opponent. But Two-Eyed Jack the Buccaneer has a Hand Cannon that can hit anyone in a direct line in front of him. Granted this ability requires loading, but can be quite devastating when it connects. Having one character limited by range while another is sitting back creating havoc could seem unfair to some. Programming games can be frustrating, but also fun! When I first saw The Dragon & Flagon, I thought of The Red Dragon Inn. After playing it, I feel it’s an apt comparison. Instead of taking place at the start of an adventure, where heroes meet at a tavern, you begin The Dragon & Falgon at the end of an adventure. 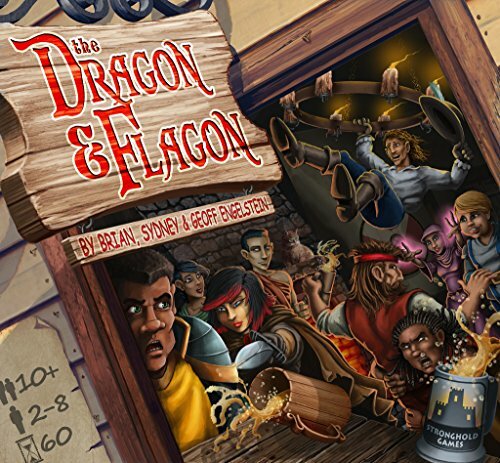 The Dragon & Flagon is definitely a fun distraction from dungeon crawling, and anyone who plays Dungeons and Dragons or Pathfinder should appreciate it. Whether that appreciation can last is hard to tell. A fun, unique take on the sword and sorcery theme. Unique play based on choice of characters. Art that sets a fun tone. Randomness which can be frustrating without the right frame of mind. Bad luck can really sour a play session. Advancement is only at the expense of other players. You like a game with some unpredictability. You want a lot of player interaction.